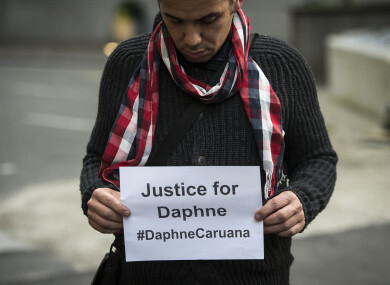 THE SONS OF a murdered Maltese journalist have dismissed Prime Minister Joseph Muscat’s offer of a reward to help find her killers and called for him to quit. Muscat has ruled out quitting and has vowed to bring those responsible for killing a reporter he has described as his “greatest adversary” to justice, with the help of FBI investigators. Yesterday, Muscat told parliament that the government would put up a “substantial and unprecedented reward,” for information leading to a conviction over Monday’s car bomb killing of anti-corruption campaigner Daphne Caruana Galizia. Her sons revealed that the government was putting up a million euros, but said they would not bow to pressure to endorse the idea. The Prime Minister asked for our endorsement. This is how he can get it: show political responsibility and resign. Caruana Galizia had used her widely-read blog to highlight numerous cases of suspected corruption, including several scandals implicating Muscat’s inner circle which had left her facing a string of legal suits. Her sons, Matthew, Andrew and Paul, said Muscat should resign because he had worked to “cripple our mother financially and dehumanise her so brutally and effectively that she no longer felt safe walking down the street”. And before resigning he can make his last act in government the replacement of the Police Commissioner and Attorney General with public servants who won’t be afraid to act on evidence against him and those he protects. Muscat called and won an early election in June after the late journalist said she had evidence that his wife Michelle was the beneficiary of a secret Panama bank account. Caruana Galizia, 53, alleged the account was used to stash kickbacks from Azerbaijan’s ruling family linked to an Azeri bank gaining a licence to operate in Malta. Muscat asked a magistrate to investigate the claims and has vowed to quit if any link is established between him and hidden offshore accounts. The investigation, which the opposition has derided as rigged, is ongoing. The journalist’s killing has caused shock around the world and prompted much soul-searching in Malta over whether the country is becoming a cesspit of corruption against the backdrop of an economic boom which some see as having allowed both organised crime and a kickbacks culture to flourish. Email “'We don't want a reward, we want you to resign': Murdered journalist's sons tell Malta PM to quit”. Feedback on “'We don't want a reward, we want you to resign': Murdered journalist's sons tell Malta PM to quit”.